Corn is rich in nutrients, including the antioxidants beta-carotene and lutein, the carotenoids which give the vegetables their distinctive color. These are essential for preventing eye diseases. Corn also contains certain B vitamins and vitamin C, as well as magnesium and potassium. Regular consumption of foods rich in vitamin C, like green peppers, for instance, which contain more than twice the vitamin C of an orange, boosts the immune system, lowers inflammation in the arteries that may cause heart disease, diabetes, and cholesterol like problems. 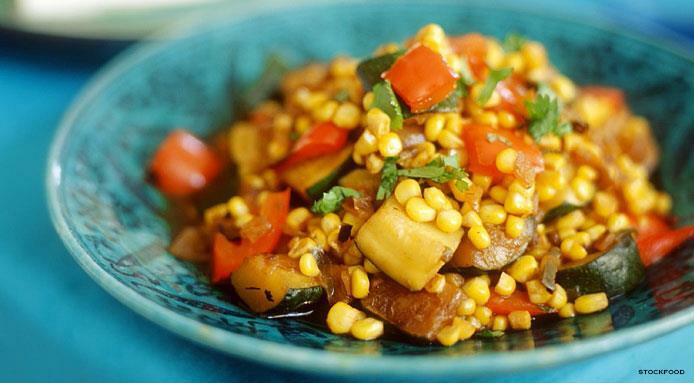 In a bowl, add boiled sweet corn, chopped green bell pepper, chopped onion, chopped coriander, salt, pepper and lemon juice. Drizzle 1 teaspoon of olive oil.